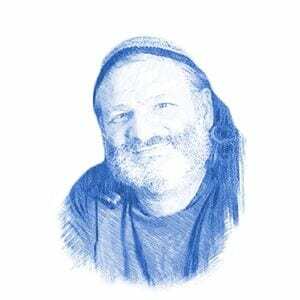 Arch of Ba’al Is New World Order’s Model for “Temple of Darkness” in Jerusalem, Believes Rabbi - Breaking Israel News | Latest News. Biblical Perspective. 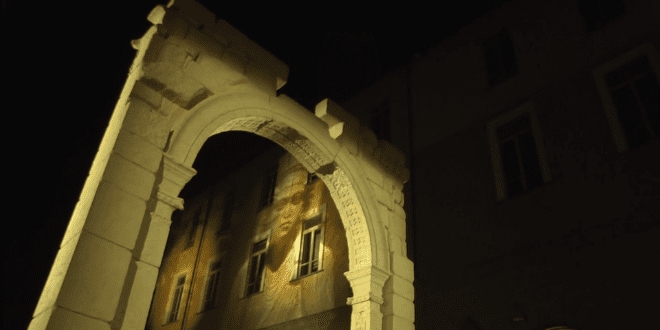 A replica of an ancient Roman triumphal arch reappeared in Italy last week, accompanying yet another summit of world leaders while attracting over two million visitors since its presentation three weeks ago. One rabbi, an expert in the New World Order, believes that the arch is the first step towards building a ‘Temple of Darkness’ in Jerusalem. The arch is a reproduction of a Roman victory arch built in Palmyra, Syria in the second century CE for a temple where pagans prayed to the Mesopotamian god, Bel, also known as Ba’al, in a form of idol worship that figures prominently in the Bible. The original arch was destroyed by the Islamic State in 2015, but last year, the Institute for Digital Archaeology used proprietary 3-D printing technology to reproduce the arch out of marble. Unlike other pieces of its kind displayed in museums, the reincarnation of the Arch of Palmyra has been appearing in the most peculiar places while attracting more attention than the original arch in Syria. During its month long visit scheduled to accompany the G7 Summit of world leaders, millions of tourists came to Arona, Sicily to view the replica. Rabbi Daniel Asore, a member of the nascent Sanhedrin, described what he believes is the significant role this replica of the Arch of Palmyra will play in the New World Order. “This arch is the first step in that process, awakening an interest in people to paganism and as a focal point for world leaders to gather around,” the rabbi said. Intense public interest has indeed followed the arch on its globe-hopping journey, as two million Italians can attest. World leaders seem especially drawn to the arch. 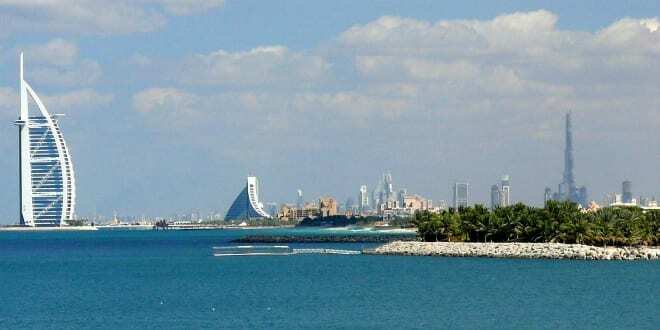 In fact, it was assembled as the centerpiece for the World Government Summit, an international meeting of global leaders in Dubai last February. The Dubai Future Foundation (DFF) has joined in the project with Oxford University’s Institute of Digital Archaeology (IDA) and Harvard University. He also pointed to the UN efforts to erase the connection between Israel and the Temple Mount. The French Ministry of Defense has underwritten over $1 million towards the proprietary 3-D technology used to create the replica. The ministry released a statement explaining that the technology “can be used by troops on the ground and scholars via their laptops anywhere to assess the condition of monuments and sites at risk”. Rabbi Asore suspected more sinister motives behind the French investment, giving a rather startling speculation on its origins. “After the Templars, the first Masons, left Jerusalem in the Medieval period, they fled to France. It may be that some influence remains in the power structure in France, via the New World Order and the Masons,” he suggested. 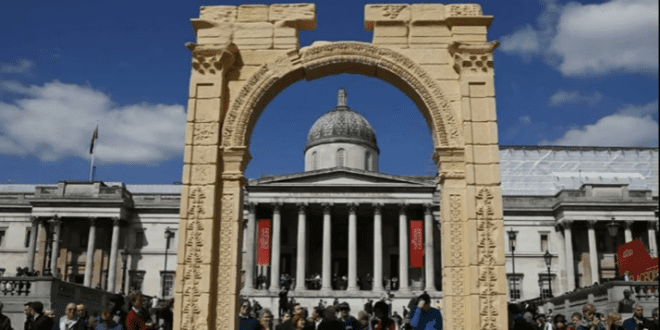 The first appearance of the arch was in April last year at London’s Trafalgar Square for United Nations Educational, Scientific and Cultural Organization (UNESCO) World Heritage Week. The unveiling coincided with the most important pagan holiday of the year, Beltane, ushering is a 13-day period known in the occult as “the Blood Sacrifice to the Beast”, which was traditionally celebrated with child sacrifice and bisexual orgies.